Inspiral offers a comprehensive package of training and services to organisations looking for staff wellbeing options. As a not for profit organisation, Inspiral is one of the only ethical wellbeing training providers in the UK. We run a number of socially aspirational activities; utilising our network of therapists to deliver holistic treatments to those in need within our community. The commercial work we offer here enables us to fund these projects. Inspiral members include several hundred professional practitioners and therapists who can take care of wellbeing events within any sector. Pricing is both competitive and fair, plus our services can be easily combined to create the wellbeing event that's right for you and your team. For example, if you want to work on mindfulness in the morning and then enjoy a relaxing pampering or massage session in the afternoon or perhaps a reflexology session for an hour followed by a guided mediation - we've got you covered. Our range of services is diverse. 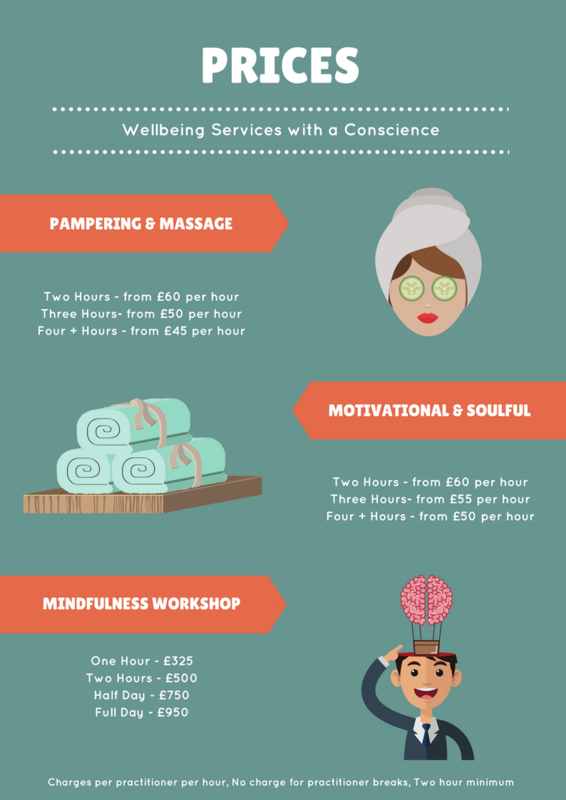 Some will be more familiar and traditional such as facials, reflexology and massage whilst some treatments are less mainstream such as Reiki, crystal healing and sound baths. All of the treatments are carried out by qualified professionals and will make a real, tangible difference to work life balance, staff morale and motivation. “Happiness is not something ready made. It comes from your own actions".